How to Easily Master Format NOKIA LUMIA 625 with Safety Hard Reset ? Welcome to Hard Reset tips & tricks community, please read carefully this information page or use search form for specific issue. Solutions and tips for solving problem at NOKIA LUMIA 625 the Windows Phone 8 family smartphone from Nokia. When you compare between NOKIA LUMIA 625 with LUMIA 520 or LUMIA 620 then we will see the upgrade LCD screen size become 4.7 inches, something that will give the user more interesting experience while using full touch screen NOKIA LUMIA 625. Some user maybe have hardness when typing using 4 inches screen, but using NOKIA LUMIA 625 with 4.7 inches LCD screen will give us better typing experience and also more easy to read web or other font reader also good for playing games. What to do to Fix Problem or Recovery NOKIA LUMIA 625 hang or not responding or malfunctions or stuck or freezing or bricked ? Like other Windows Phone smartphone, NOKIA LUMIA 625 have factory default applications, but we still can add more applications from Microsoft Marketplace. Many applications can work without problem at NOKIA LUMIA 625, but as we now maybe we make some wrong setting or something crash between each applications, this problem can be happen because the applications is not have good compatibility with NOKIA LUMIA 625, that can make problem stuck or hang or bricks or frozen or lcd touch screen not responding. In this situation, please try to do soft reset or reboot or restart NOKIA LUMIA 625, if the problem still happen then we need to do hard reset or master format. How to Soft Reset or Reboot or Restart NOKIA LUMIA 625 ? Since the battery of NOKIA LUMIA 625 is not removable, then we can not remove the battery for doing soft reset or restart the phone. If the phone frozen or hang when the screen on or in the middle of doing work, then you have to long press POWER BUTTON for several second, if you see ‘slide down to power of’, do slide the phone then it will turn off. We need to press Power button again to turn on NOKIA LUMIA 625 on again. How to Master Reset NOKIA LUMIA 625 to Factory Default ? Please remember to backup your important data before doing the hard reset to factory default, because all data and installed applications will be erased. The NOKIA LUMIA 625 will do the hard reset format, wait about three until five minutes. While waiting you will see the gear appear until it finish. Please remember, you have to follow the step From BIG STEP A until BIG STEP B by sequence. How to Restore and Reinstall Clean Windows Phone 8 operating system / firmware at NOKIA LUMIA 625 ? The smartphone NOKIA LUMIA 625 have operating system Microsoft Windows Phone 8 which already installed when the first time we buy this phone. If our smartphone have problem and the operating system damage, then we need to reinstall the clean and default running well operating system or firmware to NOKIA LUMIA 625. The file source of Windows Phone operating system or firmware already save inside NOKIA LUMIA 625 rom, it use some space at 8GB internal memory, so we do not need to copy or connect our NOKIA LUMIA 625 when we need to reinstall the operating system. Just do the simple step to hard reset or master format above, then NOKIA LUMIA 625 clean and factory default setting operating system will be reinstall automatically. How to Unlock or Fix or Bypass or Solutions for NOKIA LUMIA 625 forgot password code or security lock screen pattern or pin (lost password)? We can give a security protection or lock screen at our NOKIA LUMIA 625. But how to bypass it if we forget the security password protection? If we forget the answer, then we do not have other option except to reinstall or hard reset NOKIA LUMIA 625. How to Improve Performance NOKIA LUMIA 625 to make run more faster? Some user have bad experience that feel NOKIA LUMIA 625 run slowly after use for several months or some several times. As we know with the Dual-Core processor with 1.2Ghz speed than NOKIA LUMIA 625 will run smoothly without problem for almost any applications that we have downloaded from Microsoft Marketplace. There are several causes which can make NOKIA LUMIA 625 become run more slowly. How to make NOKIA LUMIA 625 back to faster again?, please try to uninstall several applications that we do not use everyday. Or do the hard reset or master format NOKIA LUMIA 625, so the performance will back to faster like new. 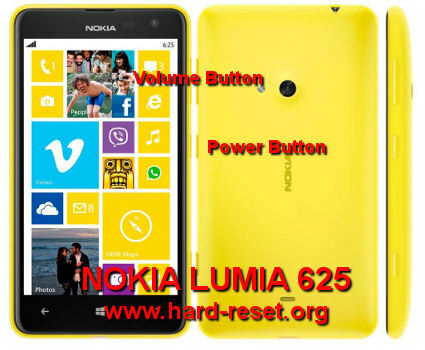 What is the Secret Code Key for Hard Reset NOKIA LUMIA 625 ? There is no secret code for doing hard reset or master format NOKIA LUMIA 625. Just follow the step above to hard reset is the easy way to do. How to Upgrade NOKIA LUMIA 625 to Microsoft Windows Amber or GDR2 Update Operating System ? If the update ready for this smartphone, then we can download and follow the step, but the NOKIA LUMIA 625 will give suggestion to use Wifi internet connection to download the update. [Q] my cell phone is nokia lumia 625 but ,after i close by code it can't open when i want ,it writes "try again after 788842 minutes" .so what can i do to solve this problem pls help me quikly!!!!!! [A] Hi, at that time you have to wait. Try to soft reset or reboot. But if still can not work then you have to consider doing hard reset using hardware button combination key. The information from this page describe about how to format lumia 625,how to format nokia lumia 625,nokia lumia 625 hard reset,lumia 625 hard reset,nokia 625 hard reset,how to hard reset lumia 625,hard reset lumia 625,how to hard reset Nokia lumia 625,nokia lumia 625 format code,hard reset nokia lumia 625. If you need another resource for hard reset, use search function at this homepage or find from our related posts. How to Easily Master Format LG G PRO LITE (DUAL) D680 / D682TR / D686 with Safety Hard Reset? How to Easily Master Format ASUS ZENFONE 5 ZE620KL with Safety Hard Reset? How to Easily Master Format ASUS ZENFONE 4 / 4S with Safety Hard Reset? my cell phone is nokia lumia 625 but ,after i close by code it can’t open when i want ,it writes “try again after 788842 minutes” .so what can i do to solve this problem pls help me quikly!!!!!! Hi, at that time you have to wait. Try to soft reset or reboot. But if still can not work then you have to consider doing hard reset using hardware button combination key. How to Easily Master Format XIAOMI MI 9 with Safety Hard Reset? How To Easily Change IPHONE / IPAD (DEVICE NAME) Identity? How to Easily Master Format HUAWEI HONOR 8C with Safety Hard Reset? How to Easily Master Format NOKIA 1 PLUS with Safety Hard Reset? community on How to Easily Master Format SAMSUNG GALAXY CORE GT-I8260 / GT-I8262 DUAL with Safety Hard Reset? community on How to Easily Master Format SAMSUNG GALAXY CORE 2 & CORE II DUAL (SM-G355H) with Safety Hard Reset? community on How to Easily Master Format Nokia Asha 302 & Asha 303 with Safety Hard Reset? community on How to Easily Master Format SONY XPERIA C (C2305/S39h) with Safety Hard Reset? community on How to Easily Master Format SONY XPERIA Z (C6603/C6602) with Safe Hard Reset ? community on How to Easily Master Format XIAOMI REDMI 2 PRIME with Safety Hard Reset? community on How to Easily Master Format SONY XPERIA M (C1904/C1905) & (C2004/C2005 DUAL) with Safety Hard Reset? community on How to Easily Master Format LENOVO K5 NOTE with Safety Hard Reset? community on How to Easily Master Format OPPO F3 PLUS with Safety Hard Reset?